On a very bleak day in March my friend Marie and I decided to go out and see what we could photograph. 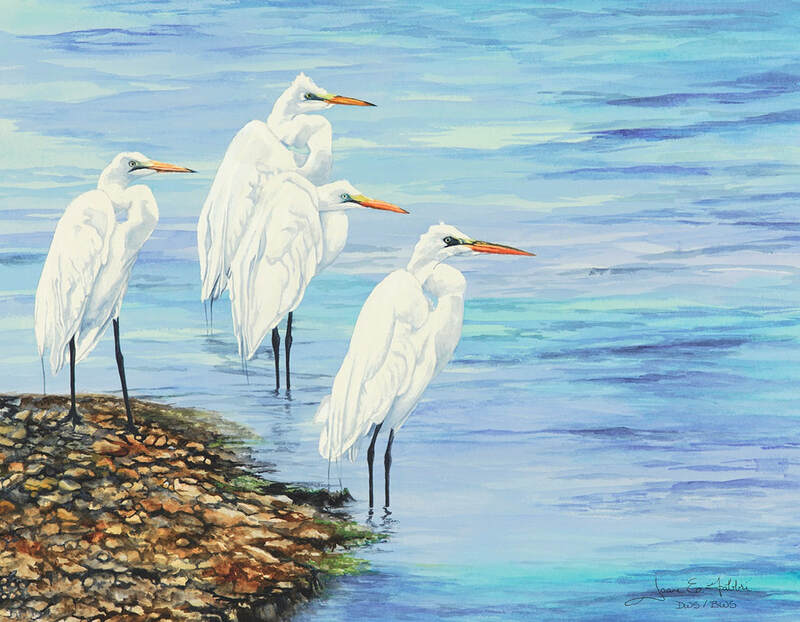 We came across this group of Snowy Egrets protecting themselves from the wind and weather. As with the “Pool Party” they seemed to be having a meeting but this one more solemn. The serious nature of their demeanor and close gathering influenced the name of the painting. 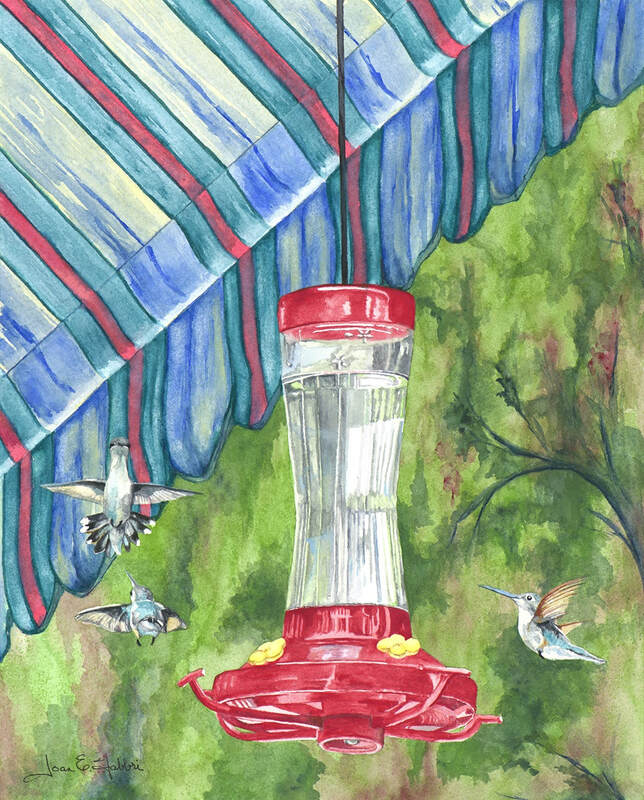 My friends Bob & Marie are nice enough to allow my to hang out at their house during "hummingbird season". During one of my visits I was able to capture this picture of these birds cheerfully eating from the feeder. They are not only joyous in their feeding but the sound that they make whizzing by is genuinely a happy feeling. barn that he made into frames. He had previously sold me a frame but is now down to his last 2. He told me that only the right picture would be acceptable for his cherished frame so I decided to meet the challenge and paint what I thought would be just right. He was pleased with the picture and can now keep his barn siding frame for himself. 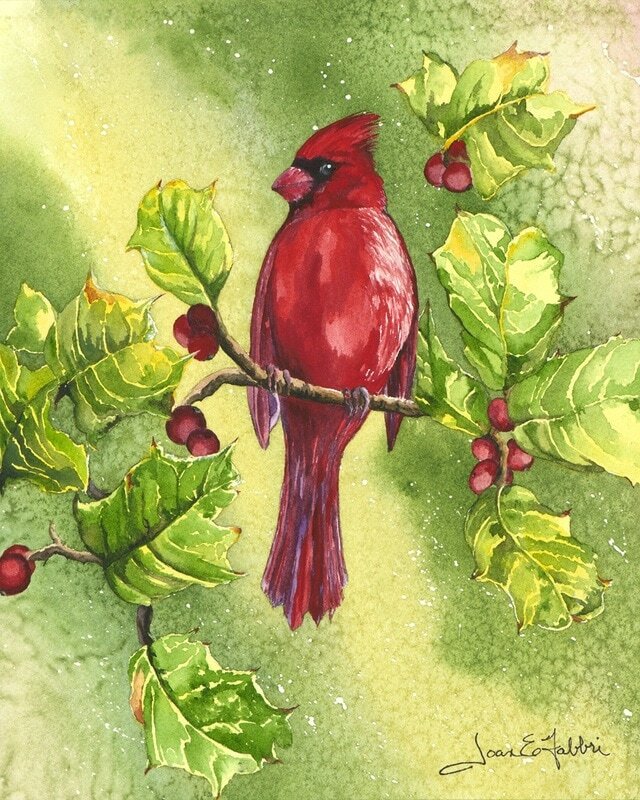 My friend Kathy who is also an artist swears that everyone loves cardinals. 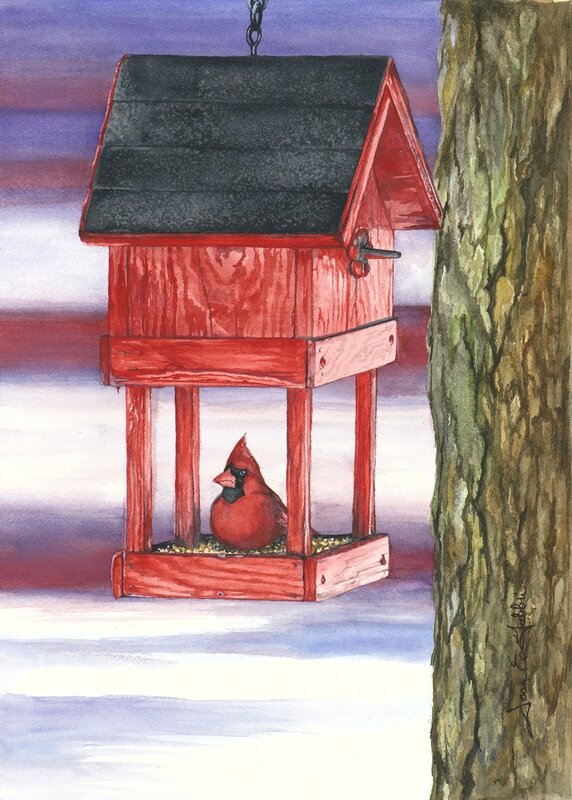 So in keeping with that theme I decided to paint a cardinal for Christmas this year. It was challenging photographing the bird as they tend to be shy. Eventually I was able to capture a shot of one at the bird feeder at Cape Henlopen’s Nature Center. 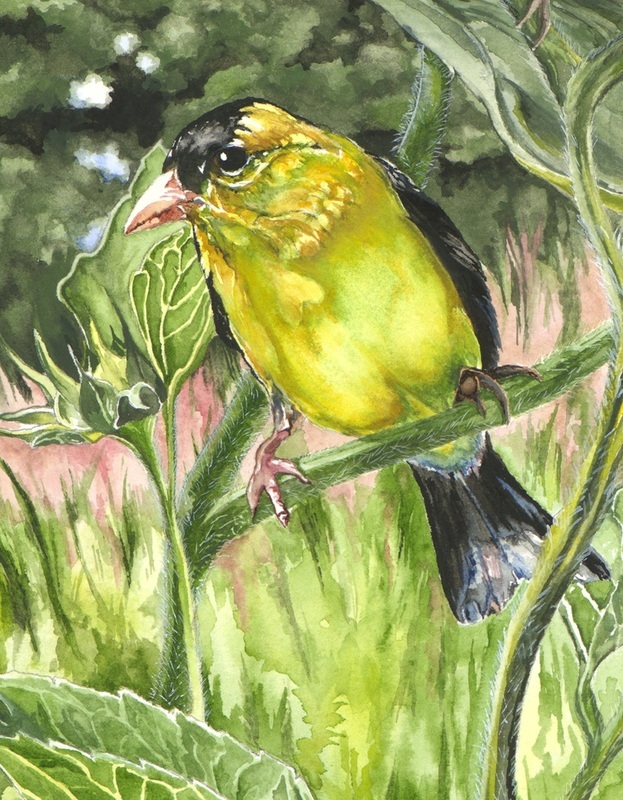 It required some color enhancement because I was quite far away from the bird, but that’s the beauty of paint! Our move to Delaware has been an education in so many ways. Of note is the abundance of new wildlife which is different than I have been accustomed to. Last spring a pair of birds decided to nest in the planter outside my dining room window. We were able to get very close to their coming and going. During their time in our window I was able to capture some photos of the bird sitting on the planter. This picture was the result of one of those photos. We have also had the opportunity to make friends with many of our new neighbors. One such neighbor is an avid hiker and loves to hike in the Grand Tetons. On one of his trips he had the opportunity to photograph various wolves. 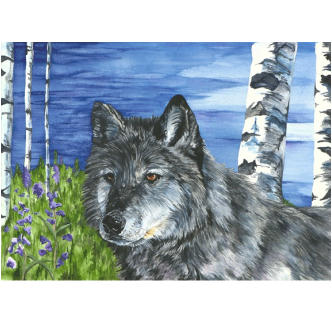 It was an education for me to learn that the grey wolf is endangered. 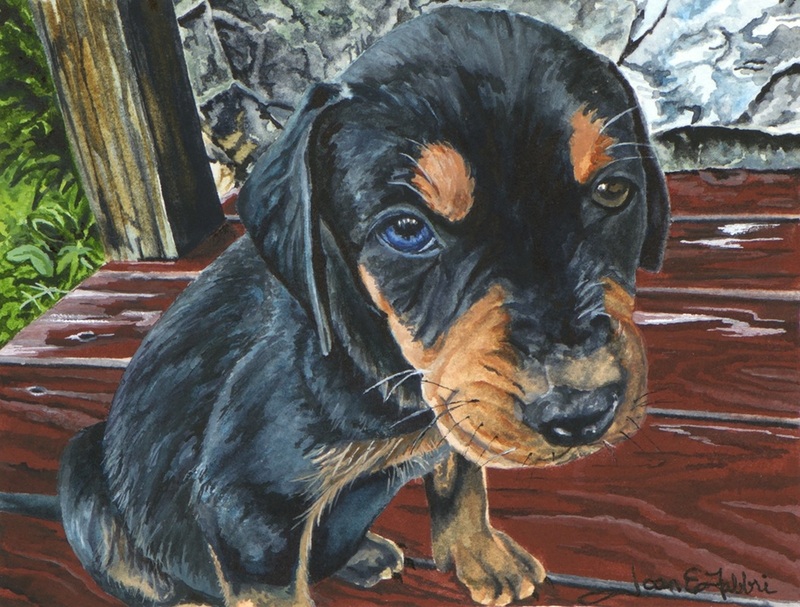 I painted this picture which was based on one of his photographs to bring attention to their plight. Since I paint from pictures that I’ve taken, I recently took a photography class to better hone my photographic skills. The instructor gave us detailed ideas of how to capture the perfect setting. What I realized was that I’d taken a number of interesting pictures in the unlikeliest of “perfect” settings. This picture was taken on a very rainy day at Prime Hook State Park. 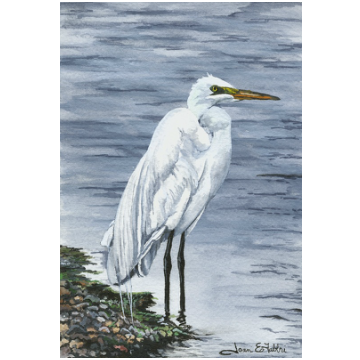 I singled out this particular bird from a group of four that were standing on the bank of the river. 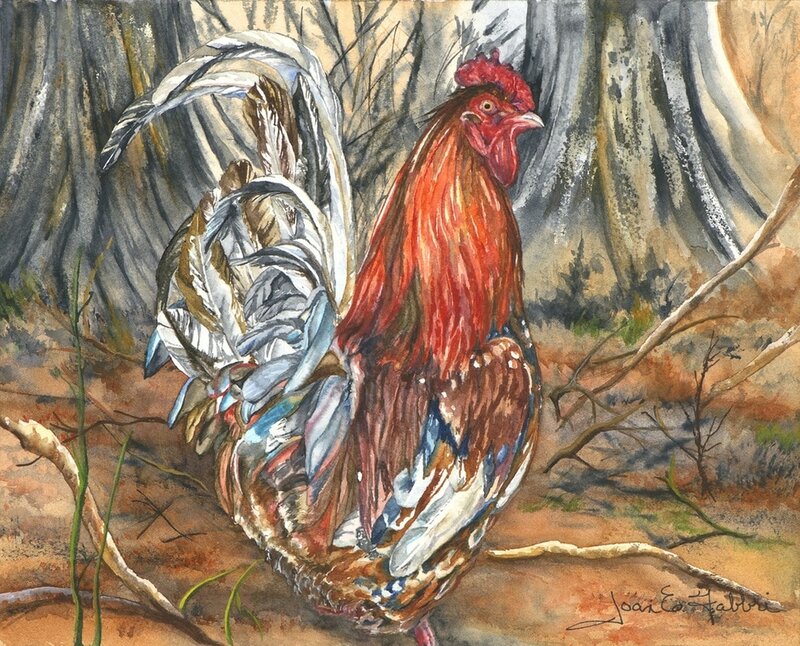 It won second place at the Delaware Watercolor Society’s 2014 Miniature Show in Lewes Delaware. Hook State Park we spotted this Heron hiding in the grasses. I knew if I got too close he’d fly away, but he lingered long enough to allow me to capture this picture of him. 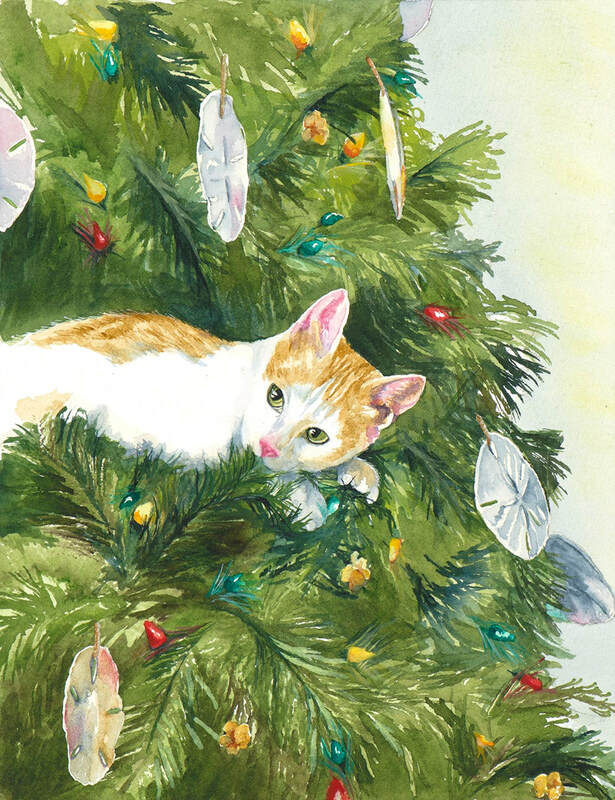 or Christmas this year I wanted to paint our Christmas card. During a meeting of the Delaware Watercolor Society we’d been given a demonstration of a “salt” technique with watercolor paint. 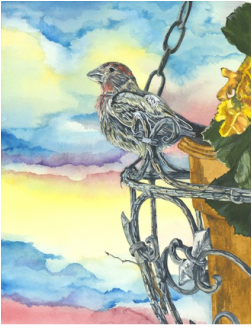 I decided to try this for the background of this painting and felt that it gave it a nice texture which helped make the image of the bird “pop”. During a visit to the Holland Christian Home with my Aunt Elaine she gave me pictures of birds that had been painted on panels. The panels were then used to decorate homes. Her enthusiasm for the subject made me decide to do a bird picture. I chose to make a compilation of various images to try to recreate something similar to one of Aunt Elaine’s bird panels. 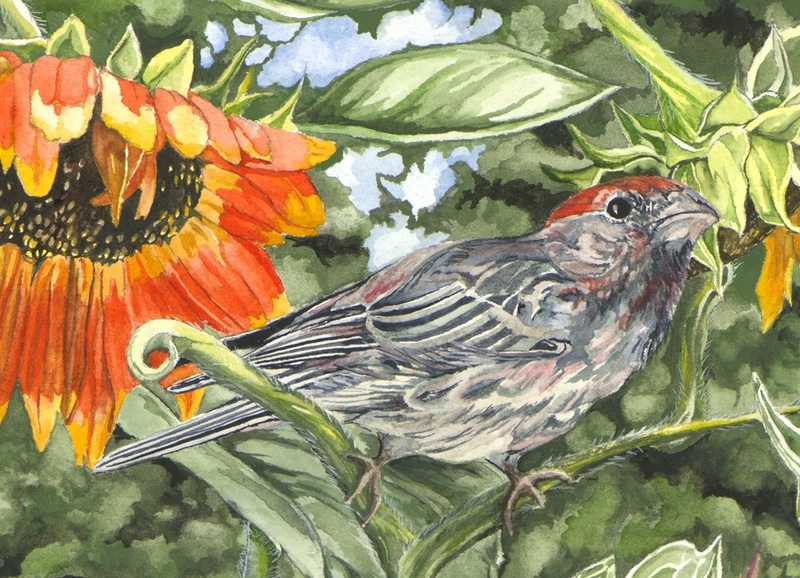 Many of the bird pictures I’ve photographed have come from pictures I’ve taken in my friend’s garden. 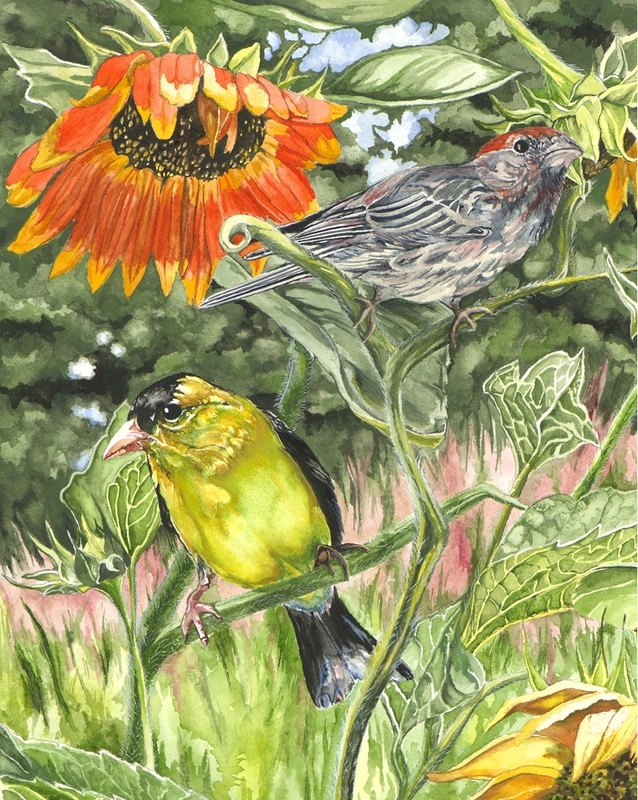 I used both his birds as well as his sunflowers to make this painting. After completion, my daughter said that to her, it actually looked like two distinct paintings put together, so… I cut it in half. I then framed them both in matching mats and frames and sold them as a set. 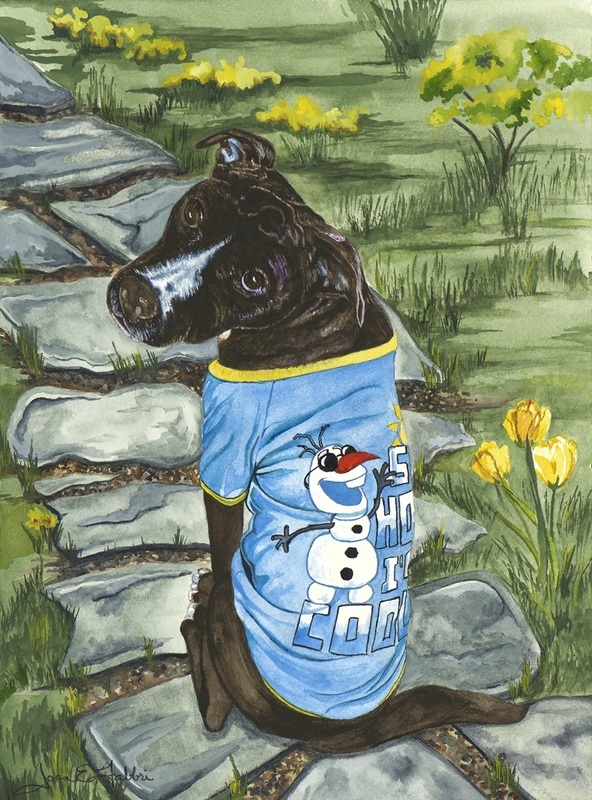 This is why on the website you will see three pictures….all the result of this one painting…. cut in half! As the mother of children it seems I have also become the recipient of their animals. On a road in Vermont one summer day, my son’s friend found a litter of abandoned puppies. Two were (unfortunately) already dead but she was able to save the rest. In his enthusiasm, my son assured her that his mother would take one of the dogs. While it was fine with me, my husband, on the other hand, was less than enthused. This picture was the first ever taken of the dog that came along with the handle “Zero”. He has become one of the best we’ve ever had and follows my husband around wherever he goes! 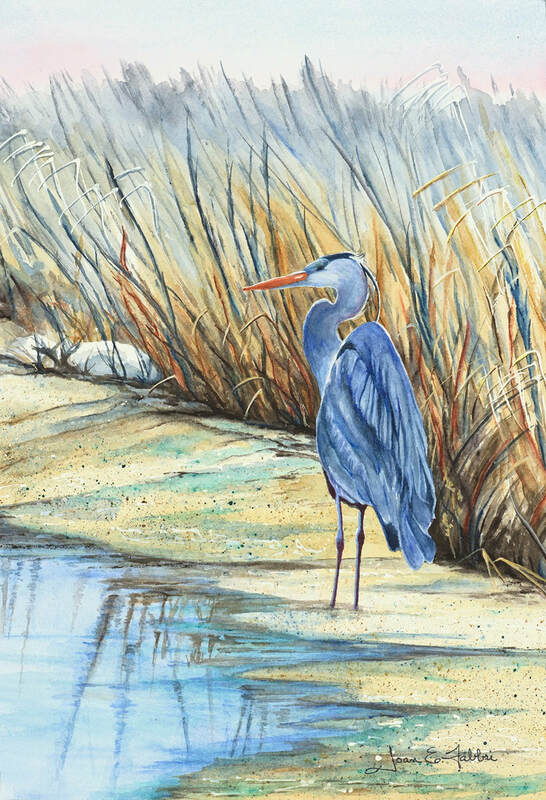 There are many heron where we live and their beauty fascinates me. This picture was taken at Prime Hook State Park which is a "hot spot" for birds and wildlife in our area. 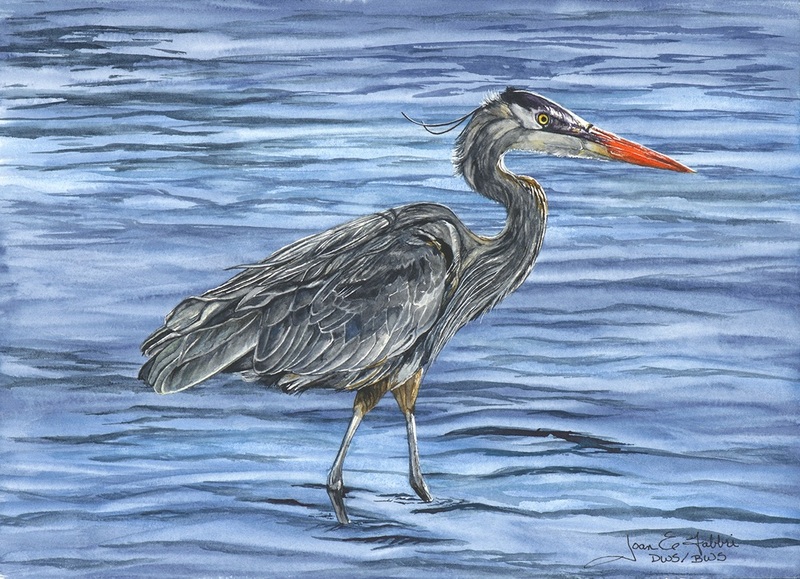 I chose water this time as the background so that I could concentrate on the intricate details of the bird himself. 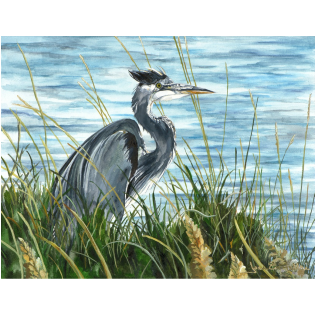 The picture is on exhibit at the Ocean City Convention Center for 2016. 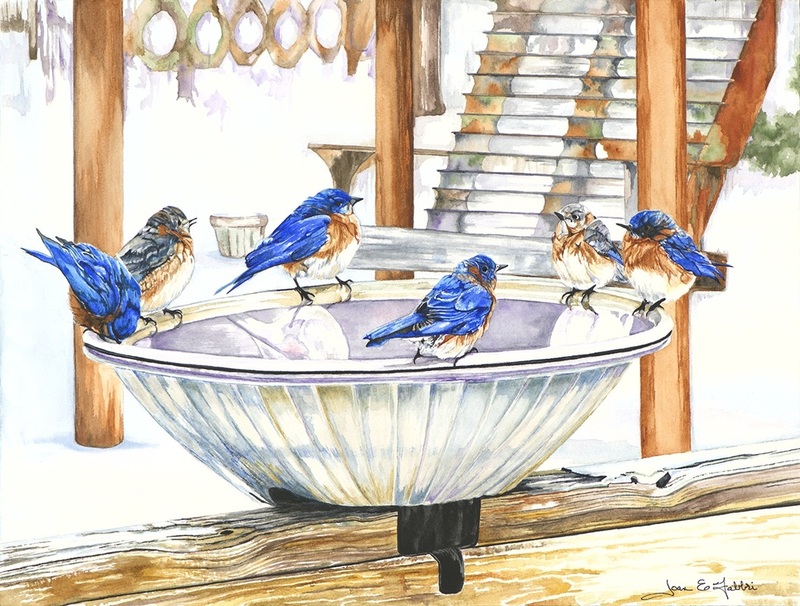 After seeing a picture of birds congregating in a bath I decided to paint. I called it The Pool Party because to me it looked like they were having a great time and involved in conversation. 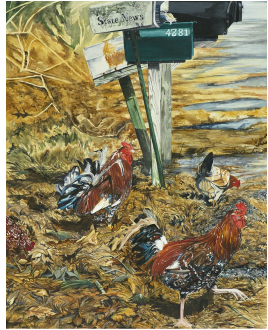 It is part of the 2016 Members show at the Academy Art Museum in Easton, Maryland.